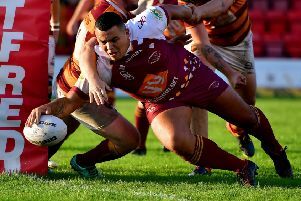 It has been a harsh start to the season for the young Maroons following back-to-back promotions, but they produced a determined effort in their latest game. Moor were level at 12-12 at the break following tries by Sam Thornton and George Croisdale, both of which were converted by Aiden Ineson. St Pats took control after the break and went on to build a 27-12 lead to ensure they would secure a third win in five matches. Jamie Bristow crossed for a brace of tries, while Danny Ryding and Sam Arrowsmith also scored. Joe Higham had a fine game with the boot as he kicked five goals, while Dan McGoldrick added a drop goal. Moor continued to battle until the end and were rewarded with a last minute consolation try by James Samme, with Ineson landing his third goal but it came too late to prevent a fourth straight defeat. Moor will aim to break their duck on Saturday when they travel to third-bottom Featherstone Lions, who have won one of their opening four games. The Lions slipped to a 44-18 defeat at home to high flying York Acorn last week. Dewsbury Moor Maroons kick off their Yorkshire Men’s League Alliance Division Two campaign on Saturday when they entertain West Bowling on Saturday. Bowling defeated Heworth 24-16 in their opening game and the division also includes Shaw Cross and Dewsbury Celtic.